The world No 1 continued his winning start to 2019, having been victorious at the World Darts Championship then beating Michael Smith on the opening night of Premier League Darts. 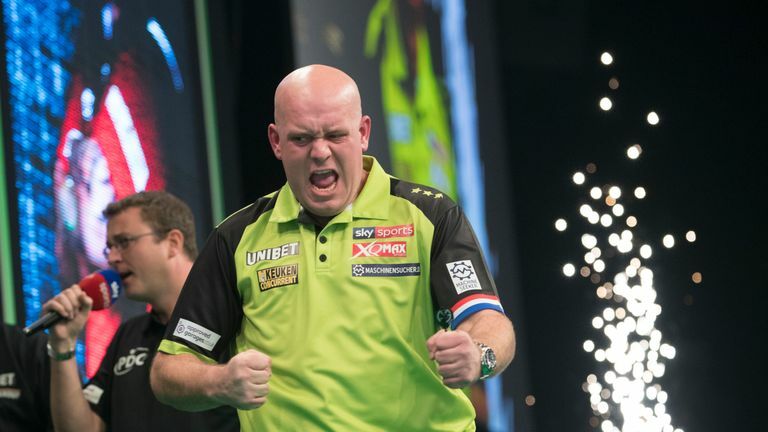 Van Gerwen hit four 105-plus averages on the first day of the 2019 ProTour and is now unbeaten in 18 matches. Elsewhere in the tournament, Glen Durrant lost 6-5 to Alan Tabern in his first match as a PDC full-time player. Durrant must rebound quickly because he replaces the injured Gary Anderson on Thursday in the Premier League, live on Sky Sports, against Daryl Gurney. Premier League stars Rob Cross, Gurney, James Wade, Gerwyn Price and Raymond van Barneveld were all eliminated by the last-16 stage on Saturday. Scott Baker, playing in his first PDC event, beat Cross then Kyle Anderson before losing to Van Gerwen in the semi-final. 'Bully Boy' Smith, beaten by Van Gerwen last Thursday in the Premier League, lost to Peter Wright in the quarter-final despite having a 112 average.